Nobels PRE-1 universal preamp/booster - Electric guitar players can set 2 volume levels for lead and rhythm and can overdrive any amplifier when neccessary. Clipping indicator included. Acoustic players with piezo pickups have perfect command over volume and tone with the seperate controls. Controls: Bass, Treble, Level. Input jack for remote switch. Nobels has several od's/dist's that might be interesting, lots of eq controls. Pre-eq? 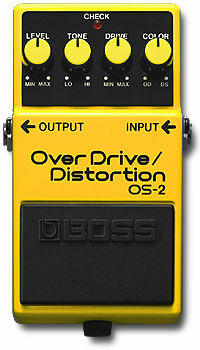 Winners of the 1992 Guitar Player distortion box shootout for Overdrive: Boss Overdrive/Distortion, Marshall Bluesbreaker. "Newly developed Dual-Stage Overdrive Circuit offers a level of sustain and compression unmatched by any overdrive pedal in history. Dramatically increased full bass response and improved dynamics yield a "bigger" sound than any previous BOSS overdrive pedalDynamic, non-muffled tones reminiscent of classic overdriven "stack" amps. Straightforward Drive, Tone and Level controls. A New Level of Rich, Dynamic Overdrive. 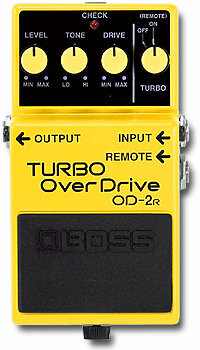 In 1977, BOSS introduced the now-legendary OD-1 -- the world's first compact overdrive pedal for guitarists. The rich, warm tones that this stompbox produced immediately set it apart from the harsh distortion boxes that had come before it. 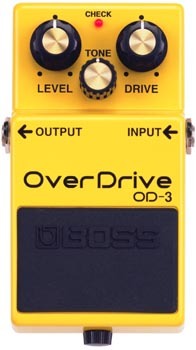 On the 20th anniversary of BOSS compact pedals, we proudly introduce the OD-3 OverDrive, giving guitarists a greatly expanded range of smooth overdrive tones and improved response while staying true to the original." "OverDrive/Distortion - The OS-2 gives you a choice of overdrive or distortion or lets you combine both - all in a single compact pedal. This integration gives you more options than using serially connected units, and provides hard distortion that maintains the subtle nuances of single-coil guitar pickups." 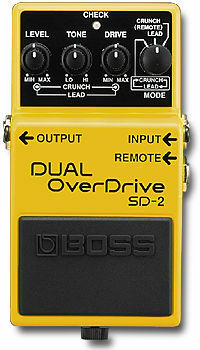 "DUAL OverDrive - The SD-2 features independent circuits to produce two totally different overdrive effects. In LEAD mode you get a thick, smooth sound. CRUNCH mode gives you a fat, crunchy sound that's tailor-made for riffs and backing parts. You can even independently modify these two tones with the dual-purpose LEVEL, TONE, and DRIVE controls. What's more, the LEAD and CRUNCH modes can be switched with the pedal switch or optional FS-5L." "produces the warm, smooth distortion of an overdriven tube amplifier while maintaining the subtle nuances of your picking technique. Unique asymmetric overdrive circuitry delivers a genuine overdrive effect for a classic guitar sound. A tone control is also provided for precise tonal adjustment." "TURBO OverDrive. Vast array of distortion from slight edgy to maximum overdrive. Foot-switchable Turbo mode (with optional pedal). Level, tone, drive and Turbo controls. From slightly gritty to completely heavy metal. The Turbo circuit can be turned on by hand (on the unit) or remotely with the use of an optional footswitch like the BOSS FS-5L." "Blues Driver - Classic "blues" guitar tones with outstanding tube amp simulation. Warm distortion and overdrive. Responds to nuance and volume changes. 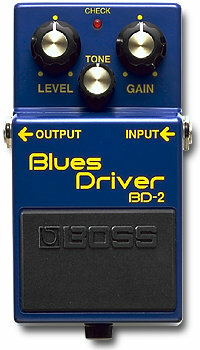 The BD-2 delivers the creamy, yet crunchy sound associated with great blues guitar. Instant access to the kind of warm overdrive and emotive distortion usually reserved for 30-year-old tube amps." I think MXR makes a highly adjustable combination overdrive/distortion box, in which you can blend the two together. It's yellow and it's wider than it is deep. >The Ibanez TS-9 is nothing but two op-amps (solid state), and one of them has diodes in the feedback to produce distortion. A TS-9 sounds terrible direct, since it's got nothing to do with tubes, and it's only pre-amp distortion, not power-tube saturation. However, people dig the sounds it produces *when* put before a normal, cranked tube amp - it boosts your signal way beyond the normal output levels of a guitar, which makes the tube amp overdrive more than before. The reason why you don't puke at the truly ugly-sounding solid-state clipping is only thanks to tube preamp / power amp and speakers. Put a TS-9 into a solid-state amp and listen to it through headphones, and you'll turn just as green as the box itself. I believe that the Tube Screamer effectively mixes run-of-the-mill distortion with clean guitar signal. 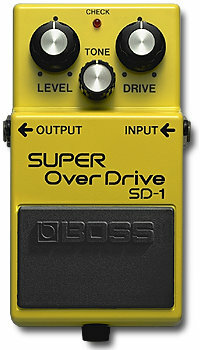 I hypothesize that all true guitar "overdrives" do the same. This general approach is clever and simple -- a way to get sustain without using compression and without clipping the signal to death. To my ears, the Tube Screamer lets some clean signal through, mixed with some distortion, but Keen points out that it does not use this approach, electronically. Take a generic distortion box. Route it into one channel of a mixer. Router clean guitar into the other channel. Mix them so the clean signal peaks above the distorted signal. You have just created something like a Tube Screamer. I think the Tube Screamer circuit is just a decent balance of controls that is optimized for pushing a tube amp. Effects specialist Keen says the entire signal is distorted; I'm skeptical. Someone said Hotel Illeness by the Black Crowes has a good overdrive/distortion sound. >I just built the dual booster from Jack Orman's DMZ page (http://members.aol.com/jorman/) and I've got to tell you that it's one of the cleanest, purest (no tone coloration) boost pedals I've ever heard. We tried it through my friend's Trainwreck and Dr. Z Route 66, and he was so impressed (this guy owns/has owned just about every pedal and amp ever made--no joke) that he wants me to make him one. We A/B'd it and there was virtually no tone change between straight into the amp and pedal into the amp once we got the volumes equalized. >Has two separate boost channels. I set one for a nice clean rhythm setting (it pushes the preamp just enough to get more clarity and punch, but, if set correctly, doesn't boost it into overdriving) and the other channel (to which I added a five-position treble boost switch) I set just enough to give a bit more presence during solos. 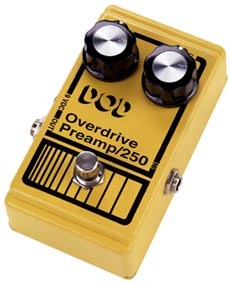 If you want to crank the controls up, you can get some nice overdrive out of this also. For those of you handy with a soldering iron, I highly suggest this project. Total cost for parts (depending on where you buy them) is about $30.00. Transparent level boost. [what is the maximum output voltage?] David Covell wrote: "The Klon is designed to do one thing well: boost the signal while having minimal effect on the frequency response and adding minimal self-induced distortion. The Klon ($299 list) is not the ideal overdrive, nor is it likely to suit the tastes of everyone. However, in terms of frequency-response alteration it's by far the most transparent pedal I've yet found, and has the most clean gain capability. Players who want compression, midrange emphasis, and other side effects of the typical TS-style overdrive will almost certainly be disappointed with the Klon. Its strength lies in its ability to push an amp's front end with a hot [high-amplitude] signal with minimal self-generated distortion and frequency coloration. Unlike the TS-type pedals, the Klon can be subtle; when dialed for clean boost it really warms up a clean tube amp at fairly low volumes. I can get fat, sustained tone at conversational volume that only breaks up on heavy attacks and lends itself to a variety of styles that call for a relatively clean tone. I'm a lousy jazz player but I do a nice jazz-inflected blues style that sounds best without audible distortion. The Klon allows me to add some of the desireable effects of overdrive (i.e. sustain and thickening of treble notes) without undesired clipping. Conversely, the Klon can be dialed to provide a significant amount of self-generated clip with a Class-A-like top end that works very well with the neck humbucker on my Les Paul of Suhr. It can be too brittle if overused, but experimentation will find some great combinations of the Gain and Tone pot values to produce a nice medium crunch. Once again, it won't be to everyone's taste, and it sounds very little like a cranked TS/FD. It's not perfect. but it's the closest that I and others have yet found. I'm still searching; I talked to Dave Barber yesterday about his Tone Pump and new Burn Unit, and I'll be sending him a check for one of them as soon as I decide which one I want. The former is said to be Klon-like in its transparency while the latter imparts an intended coloration which I'm very curious about." MXR Micro Amp (plain level boost, slight high boost). >For a clean boost to your signal, the Z.Vex "Super Hard On" is excellent. Not cheap at about $150, but much cheaper than a Klon or any boutique overdrive pedal. Just one knob, however. No overdrive/distortion/fuzz, etc. 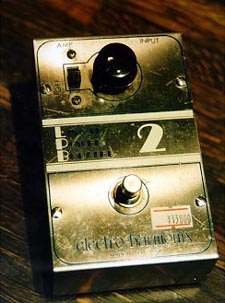 Tone Pump (H-C) http://www.angelfire.com/biz/tonepump. It's black, rectangular with three knobs, two switches, and two colored diodes. Thread on Tone Pump and other boosters and here. Housed in a beautiful 14ga.steel enclosure, powder-coated Ranar Blue. Antique white dakaware knobs. The first channel is the "Overdrive Mode" capable of Clean Boost or non-compressed overdrive (using Pull Comp-Cut "up" position) or choose light to medium softer Overdrives (Comp-Cut "down") all with no change to your guitar and amp's original tone. The Tone knob is a very effective Presence control that can smooth out or add upper harmonics...12 O'clock being neutral. There's also a footswitchable second channel "Boost Mode" with its own separate Distortion control for medium to higher gains. This pedal gets its natural sound through the use of Asymmetrical Clipping and a "Feedback Loop"circuit, which creates distortion high in even-ordered harmonics like those created by a Class A tube amp. $199 list. : : : : Has anyone compared the Hot Cake to the Klon? : : : : I just got my Hot Cake this morning and I honestly like it better than the Klon. I think it does the clean boost thing just as well and has a much wider gain structure than the Centaur. The size of the box (think DynaComp) blows the Klon away. I own a Klon, TS-808, Full-Drive 2, and love all of them. Suddenly, this box might be the one to take to the proverbial desert island. This thing is inspirational. : : : I live in DC and bought a Tone Pump up in Baltimore. It is a very good pedal, but not good enough to say it's better than the other ones in question. It's all opinion and minutiae. I think it's too trebly and harsh sounding. To really increase the voltage, perhaps this miniature 22-watt solid-state guitar amp in a pedal configuration will do the trick... this could really be useful once there are many power-tube saturation pedals available; the final full-range power amp as well could be just literally one more stompbox. You could put one of these before the power-tube saturation pedal to blast the hell out of it, with no preamp distortion, if you want. The only 22 watt pocket-sized power amplifier. 22 watts into a 4 ohm load. 1/4" Input & Output jacks. Big, bright red LED indicator. Great for use with Lanilei speaker cabs. Comes with cool carrying bag. This unit doesn't really do anything by itself per se. There's a single knob for volume and an on/off slider switch, that's all. What it does is simply boost you output from your guitar or boost the signal going into the amp, as if you had super high output pickups If you use two units you can set one with the volume all the way up and the second volume anywhere and the first one will overdrive the second creating a slight overdrive. If you run into a clean amp you will only get louder, if you use an overdriven amp you increase gain. It is a tad bit noisy when the volume knob is all the way up but it's not any greater than an overdrive or distortion pedal. It's actually slightly less noisy than my Ibanez TS-9. I use my unit with a Jazzmaster or Tele into a Fender Blues Deluxe with the drive control maxed and the LPB volume all the way up and it turns the B.Dlx into a high gain amp. Probably very similar to what the Hot Rod Deluxe sounds like. I compared it directly with the TS-9 which has been modded to TS-808 specs with the gain all the way up on both and they sounded very similar. I am considering in fact getting the LPB-2 which is the pedal version and using it in place of the TS-9 since I can make the LPB have true bypass where with the TS-9 I cannot, and the TS-9 adds a bit of noise to my signal. A single transistor, a couple caps, a few resistors, a switch, a pot and two jacks. It doesn't get simpler than that. And all the components are handwired without a circuit board. I'd probably take a few backups since their usually so cheap I can afford to buy a few more just to have them. I would buy it again, actually I probably will buy an LPB-2. Actually I traded an autographed Mudhoney flyer for it, and since I don't like Mudhoney all that much I'd say I made out pretty well. It even had the box with it. Pure simplicity but a great unit in my opinion. There are only two controls on this thing, on/off switch and a gain knob. At high gain levels, it gets noisy as it is a very simple preamp cirucit, no attempt was made to keep noise low. The typical EH sheet metal case means it can get banged around, but in general there is little to go wrong with it. The LPB-1 was sold a way to make your guitar "ten times louder". Well, what it really does is boost your signal going into your amp; that means more distortion, mostly. I've used it as a volume booster with instruments that have weak pickup output (Daneclectros, for instance). It's the first EH effect to be marketed and so has some historical significance but it's hardly a must-have effect. >>A DOD FX-10 FET preamp pedal, which you can set to boost without affecting your tone much at all (I set it to boost and roll off a little top). >Good one. Nuthin but gain, no distortion. Inexpensive, too.